It's no great surprise that Robert Kubica has figured highly in all the end of year driver polls. He even earned top spot in Autosport's all-inclusive list of the top 50 of 2008 from any series, beating Lewis Hamilton in the process. The fact that he did so despite having a few disappointing races in the last half of the season says a lot about the impact he made in the first part, when for a while he seemed to be a genuine world championship contender. Beating McLaren and Ferrari outright always going to be a stretch, but at least he was close enough to keep the pressure on both. 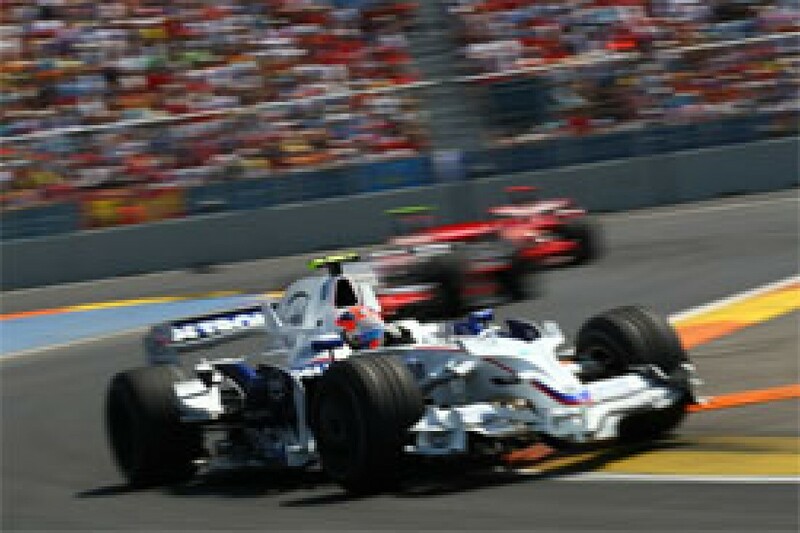 The most impressive aspect of BMW's 2008 season was the way things turned around following the initial tests of the F1.08. On its first outings the message seemed clear - heading into this new era of a standard ECU and no electronic aids, the team had somehow lost the plot. I'm sure I wasn't the only one to cross BMW off the list of those most likely to challenge Ferrari and McLaren as best of the rest. And yet by Australia, the team was a force to be reckoned with. "In the winter we knew that our car could be strong," recalls Kubica. "As the team's evaluations, simulations and wind tunnel data were saying it was a big improvement compared to last year. When we turned up at the first test it wasn't the case, and we faced quite a lot of problems. But the response of the team was very good, and in Australia we were performing better than expected. "We did have the old car in the first test, the rollout, and we saw which area the new car can be stronger and which area the old car was better. So all in all as always there were some question marks, we saw some doubts and some problems in some areas of the car. "The engineers did a very good job. We tested quite a lot of new stuff, new solutions to help the car. And we did have a strong car. Quite difficult to drive, quite difficult to set-up, but it was performing well. I think we were in some ways surprised. As we were negatively surprised to see that the new car was not as quick as we thought, we were very surprised in a positive way when we saw in Australia that we were able to fight with Ferrari and McLaren." Kubica got off to a great start in Melbourne, but a solid podium finish was lost when he was hit from behind by Kazuki Nakajima. "This was very expensive," says the Pole. "This race was a very good weekend, until we changed strategy, which became maybe not the best option for me as I was in second place. As for Nakajima, if you miss braking and you crash in racing conditions it's okay, it can happen to everybody. But if you crash behind the safety car it shouldn't happen, that's it." Things got better over the next few races. He was second to Kimi Raikkonen in Malaysia, and in Bahrain he was third, not much more than 5secs behind winner Felipe Massa. That weekend pole was also a major landmark for both Kubica and the team. In Spain he was fourth, again a little over 5secs off the winning Ferrari. Although he went on to win in Canada, in pure performance terms the package was arguably never quite as strong again. "Overall in the first three overseas races we were very strong, able to beat McLaren, able to beat Ferrari," explains Kubica. "When we came back to Europe slowly the gap became bigger, and we lost a bit of ground to them. "We kept that gap until the end of the season. Even when we were won in Canada, we were not really the strongest one. We were okay, we were in the front, but we were ahead because of circumstances. As this is racing it can happen, and in some occasions we were unlucky. All in all I think we started the season very strongly, stronger than we were later." Canada was of course the high point of the year, not least because the result left Robert in the lead of the world championship, four points clear of Hamilton. However, the man himself cites the soaking wet Monaco GP as his best performance. Don't forget that he didn't put a wheel wrong - while even winner Hamilton survived a heavy brush with the barrier. "From a result point of view Canada was a highlight for sure, but this year I think I have driven very good races on many occasions," he says. "Monaco was a difficult one! I think we were not the strongest ones in the wet, the car in my opinion is very difficult to drive - at least I don't feel it properly - with a very inconsistent balance. To finish second in Monaco and third in Monza in the wet was something special. "Monaco from a driving point of view, I was not the fastest one, but I think I did a very good job to stay calm, bring the car home. I put the maximum effort and consistency with no mistakes. I knew I could no attack too much because the car was very difficult to drive, and I put everything to stay calm and be as safe as possible from a driving point of view, and it paid off. "Another very good weekend was Valencia, where I think with a not very strong car I was able to finish third. Okay, the gap to the winner was very big, but still in qualifying I did a very good lap, three laps heavier than Felipe and just three-tenths slower. It was an extremely good qualifying and a good race." Valencia was one of the last races of 2008 where everything fell into place. Just before the Spanish street event he'd endured a couple of disappointments. "Hockenheim was unlucky because of the safety car," says Kubica. "Actually it was becoming a very strong race. I was not expecting it to be so good. In the first one and a half stints I was able to keep the pace of Kovalainen and Raikkonen, so the pace was really good, and then the safety car came, so the guys who were behind came to the front. "We started with option tyres, which for us was quicker. If you stopped the race on lap 37 or whatever it was, the race was very good! We had to put up with the prime tyres for over 30 laps, which had a warm-up problem. "Hungary was a disaster, because of tyre pressure problems, unfortunately because there was good opportunity to score good points. I was P4 in qualifying and then for three sets in a row we had completely the wrong pressures. It was a disaster to drive. In some points of the race I had enough really, I couldn't drive this car... I was nearly spinning on the straight, I had so much wheelspin and the car was so much on the nose. But there were so many Polish fans, and because of luck I managed to score at least one point." Kubica was not exactly happy with the team errors in Hungary, and there was another fumble in Spa. "In Spa unfortunately we missed a podium due to a pit stop problem, otherwise again it would have been a quite good race with a good podium finish," he says. "As always in a season there are ups and downs, but from a driving point of view I'm pretty happy with all the races I did." In Singapore the team made an expensive bad call under the safety car, not bringing Robert in at the first opportunity - a mistake that left him floundering in 11th place. An excellent second at Fuji left him just 12 points off the lead with two races to go and seemingly back in the championship fight, but his season trailed away with sixth in China and then a frustrating non-score in Brazil, where once again the team made a bad strategy call. Perhaps the most impressive aspect of Kubica's season was the lack of mistakes, and not just on the track. Other front-runners had finger trouble on the start-line, left pit stops prematurely, or failed to spot red lights at the pit exit - Kubica made no such errors. He banged wheels with Heikki Kovalainen on the first lap in Singapore, but otherwise didn't involve himself in any collisions. His only off came in the wet at Silverstone, but given the circumstances, he could be forgiven that one. "It was a mistake, because in the end I didn't finish the race," he admits. "But to be honest if you spin in the middle of the straight line on fifth gear, you cannot do anything. Unfortunately it happened, and unfortunately I lost quite a lot of points there. It was not a mistake because I was overdriving or I missed braking or something, I just went on the power in fifth gear and took a river which was so much water and just spun off. I was unlucky because I couldn't stop as I was backwards. I even overtook Kovalainen backwards - on television you cannot see, but I did 400 metres backwards! 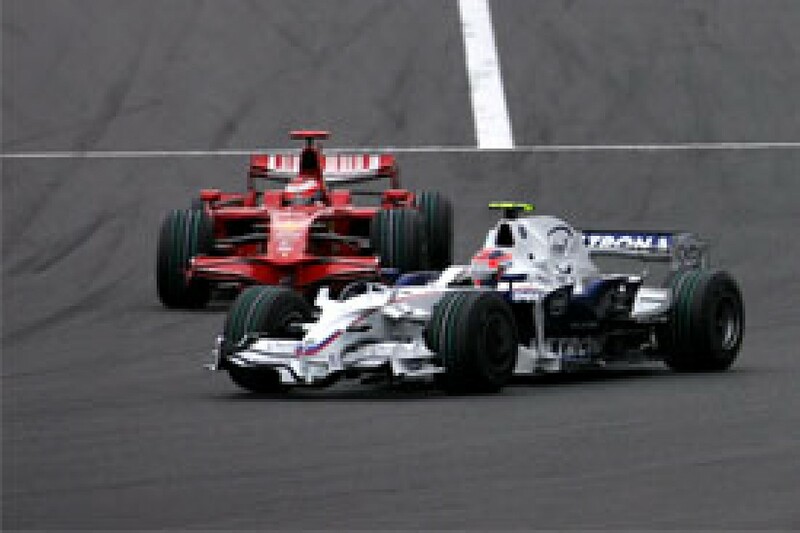 It was not really a lucky one, but this is how it is..."
Brazil allowed Kimi Raikkonen to steal third place in the world championship, robbing Kubica of what would have been a worthy reward. He ultimately finished 23 points behind Hamilton, but the fact that he led after seven races - and was just 12 behind with two to go - gives plenty of food for thought. What if his luck had been just a little better on a few occasions? And what if BMW had maintained the sort of development rate achieved by Renault? As the year went on, Kubica made it very clear that the latter thought had occurred to him. 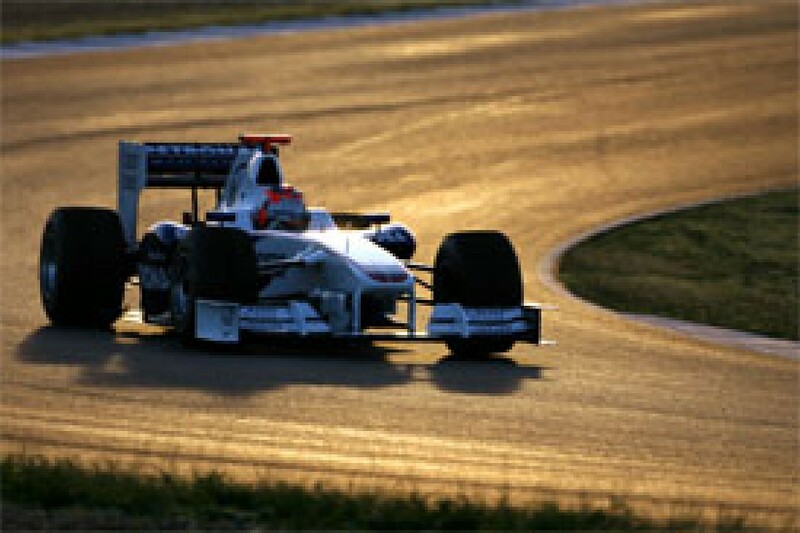 To outsiders it seemed that BMW had their long-term plan, one that involved major emphasis on 2009, and that changing tack and putting more effort into the F1.08 was not up for discussion. The reality was a little more complicated than that, but Kubica made it pretty clear that in essence, that's how he saw things. "To be honest I don't have any clue about how much force or how many people went to next year's car, I just can see that we didn't improve as much as we were expecting," he says. "The guys were working hard to improve the car, but the parts which we tested were not giving us the expected results as we saw from simulation and the wind tunnel. This can happen. I think we still had quite a good car, not as strong as the beginning of the season, but still a good car. "Mario [Theissen] mentioned many times that the goal of the team is to win races with their own forces, and in some ways we have achieved the plan, because we won a race. But I struggled to understand - if you want to win races, it means that you are strong enough to fight for the championship. So all in all I don't see the reason why it can be excluded, one thing from the other. After seven races I was leading the drivers' championship. And we were leading also at some point, after Bahrain I think, the constructors' championship, and I think we had to take the opportunity to fight. "It's true that the team was not really planning to fight for the championship in this season, but in this sport you cannot plan I think. You have to just take the opportunity. "I was taking this chance like the only one I could have, because you never know in your life. It's very difficult to plan everything. Okay, maybe the team has a big approach and they know a bit more and they have their own strategy of racing. But I'm a racer, I'm not a strategist, I'm not a businessman, I'm not, you know, planning my future. I think I have a different view a bit." In other words, the BMW management's assumption that 2009 will be the big step might not prove to be correct, and the team might struggle to come as close to glory as it was in '08. One thing is for sure, and that is Kubica himself is a stronger overall package as he heads into the New Year. Don't forget, '08 was only his second full season, and his first had been spoiled by struggles with a car that he did not feel comfortable with. "For sure I have more experience and in some ways I have improved as a driver, as always. I felt better working with my engineer of this year, we did a better job, and the results show that I was really struggling last year. "I think 2007 was one of the worst in my career, if not the worst one. Not only from a result point of view, but overall I was unhappy. Things were not working at all, and I think we were not working as a group, the team. "When I was quick I had technical problems, and when I was slow I finished many races which I was not able to show up 100% performance, because of some small problems. All season was very bad. I had downshift problems with the rear locking everywhere, and we never did get on top of it until we introduced new regulations, the new ECU, and I think it became much better. It showed up that last year's systems, which should help, were really disturbing me. It was disappointing." So what of 2009? 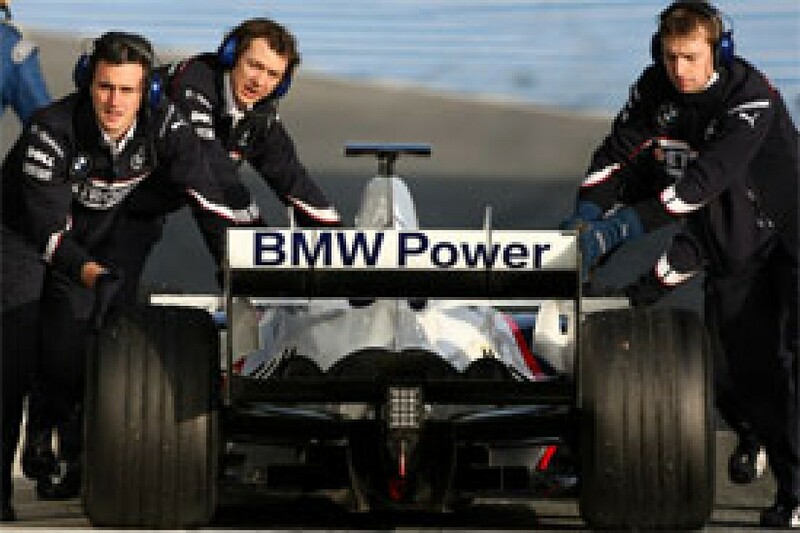 Can BMW get the job done? "It's very difficult to predict," he says. "Especially at the beginning of the season I think a lot will depend on the guys who are in the workshop, who are working, if they get it right. Also because of luck sometimes you might discover one thing which is working better than the others. "But I think the strong teams with much more resources and more power, they will get back. We saw also this season in the beginning some teams were struggling more than others, but after three, four, five races, the whole field became more packed. The gaps were very small, and you saw Toro Rosso in front, not only in Monza but also dry races they were very strong. It's very difficult to predict."